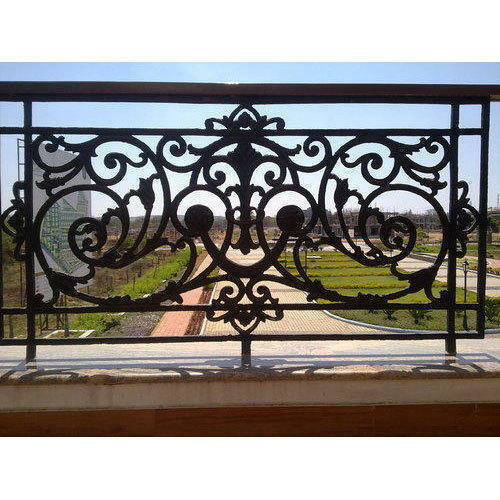 Manufacturer of cast iron grill and other types of design in cast iron grill and gates in rajkot. Hari Om Traders, one of the leading Manufacturers and Traders of this impeccable range of Metal Products began its operations in the year 2010. The offered range is known to be made up of the finest Metal Gates, Railing Pillar, Iron Railing and much more has a high demand in the market. Manufacturing of this range is done using the finest raw materials and modern machines, following the norms and guidelines of the industry. This ensures the product’s finishing resistance to corrosion, dimensional accuracy, sturdiness and durability. In addition to this, the offered range is known to be marked at the most reasonable rate possible. Our highly developed infrastructural facility has been parted into a number of highly operational units, which with the high level of efficiency, help us in managing the firm’s operations, in a highly effective manner. To attain a number of the firm’s predefined goals and objectives, the facility has been equipped with all the necessary machinery and equipment. To extend our reach in the market, the facility undergoes regular up-gradation. In addition o this, our highly reputed client base, is owed to our abidance of work ethics and industry norms.